Getting the most painful thing out of the way first we go to Jan Mursak‘s injury. He went into the boards right in front of me so I lucked out in not seeing how his leg bent, but you could tell by how he was helped off that it wasn’t a small thing. They’re saying he’ll miss two months (likely starting with a rehab stint in Grand Rapids). You have to think that means Fabian Brunnstrom or Ryan Johnson will make the team in his spot now. Also painful, the fact that for the second time this preseason, Detroit’s “A” team needed a shootout to beat their opponent’s “B” team. The Wings just shot themselves in the foot too often tonight. It’s not going to work out in their favor when they’re up against a better team. Tonight it seemed like the Detroit D (the entire team, really, but it was especially noticeable in their own end) was being a little too crafty with their passing. Specifically, using these little touch passes with not enough touch, so the puck didn’t quite get where it was intended to go. While we’re talking negatives, Ty Conklin didn’t look all that good tonight. The first goal probably shouldn’t have happened, maybe not the second either, and there were two solid Chicago chances that went off the post. That said, he made a great shorthanded stop on Michal Frolik in the second, so it wasn’t like he was awful. Detroit’s top line of Henrik Zetterberg, Valtteri Filppula and Johan Franzen looked really good. Filppula had three points on the night and Zetterberg had the shootout winner but aside from that they were moving the puck well and getting chances. The pairing of Nicklas Lidstrom and Ian White looks good, too. They seem to have a little chemistry already and White has a shot from the point that I think will fit in well on this team. Aside from that, there were a few individual plays I really liked. 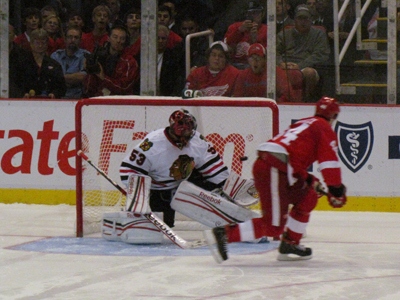 Gustav Nyquist had a couple rushes where he just jumped through a bunch of defenders to get the puck into the zone. He’s got some speed and can really handle the puck. An example of the latter would be his near-goal in the second period. He came out of a mess of people at the side of the goal with the puck. Either both teams thought the play would be stopped or no one actually saw him get it, ’cause he was all alone but just couldn’t finish. Cory Emmerton, centering Nyquist and Brunnstrom, is growing on me. I kept watching Brunnstrom, wanting to be impressed, and it seemed like it was Emmerton doing all the work. Brunnstrom clearly has talent. I can’t say what he’s doing wrong but something isn’t clicking. I think he’s worth a two-way contract as long as he’s kept on a short leash. Jakub Kindl needs to shoot more. Common refrain from last year hasn’t changed.